SAP Jam is a cloud-based enterprise social networking suite and collaboration app that helps users connect with employees, partners, and customers. SAP Jam can be utilized to protect company data by collaborating over a secure network. The app helps employees to find colleagues and experts to collaborate with, as well as providing a place to manage and organize projects. SAP Jam also provides enterprise social networking features such as project collaboration tools, task management, discussions and polls, instant messaging, discussions and chat rooms, document and content sharing, microblogging, and personal profiles. 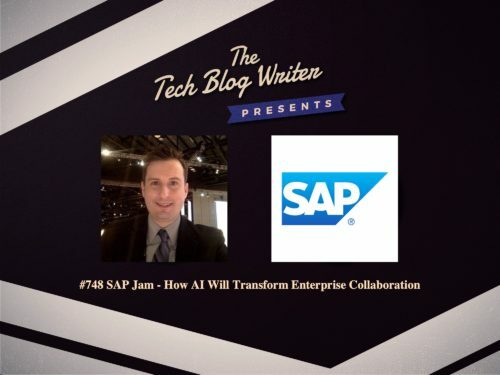 I invited the Stephen Hamrick, Vice President of Product Management at SAP onto my daily tech podcast to find out more about SAP Jam and talk about how AI in the workplace is falling short, and where it will soon be headed with key advancements made. Stephen is fanatical about transforming software and the way people work — making it faster, more efficient, more rewarding, and more human. Unsurprisingly, Stephen enjoys focussing on enterprise collaboration and how to make everyday work both more enjoyable and more impactful. But, is also a tech geek at heart and business-minded by training and experience. Stephen shares why he thinks that AI, machine learning and natural language processing will impact employee productivity and efficiency across the workplace. I learn how we can expect everything from scheduling meetings to setting deadline reminders is set to change significantly over the next 5 years.